Artichokes are a hardy perennial plant that can be simple to grow, as well as being a stunningly beautiful addition to your edible landscape. There are many varieties available to cultivate in your own backyard garden; though the Green Globe is by far the most popular in the United States. You might even say we have a monoculture of them. 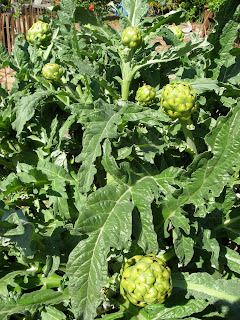 In the United States the reason new varieties of the green globe were developed was because commercially, an artichoke was needed that could tolerate a broader range of temperatures. Artichokes thrive best when temperatures are fairly mild, 55° F at night, with an average of daytime temperatures of 75° F. When the plants are young they require vernalization or chilling, at temperatures below 50° for as much as 90 hours to 240 hours in order to produce the edible buds. There are several different varieties of the Green Globe on the market, but there are also many types of purple and violet artichokes that you can grow. Many Italian families have historically raised an incredible diversity of heirloom artichokes, from Violetta di Chioggia and Purple of Romagna, to Romanesco Italian Purple. But if you want to eat some of these more unusual cultivars, you may just have to grow them yourself. I became enamored with incredibly beautiful varieties of violet artichokes that I haven’t seen in my area; I’ve begun growing them myself, and am enjoying keeping the legacy of their diversity alive. I found a violet artichoke plant at my favorite garden store, and I’m growing seedlings of Purple of Romagna with seeds from Baker Creek Heirloom Seed Company. 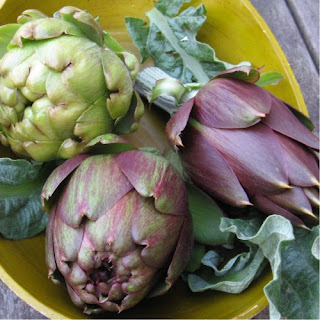 You can find other organic seed suppliers that offer heirloom seeds for many different types of violet artichokes. 1. 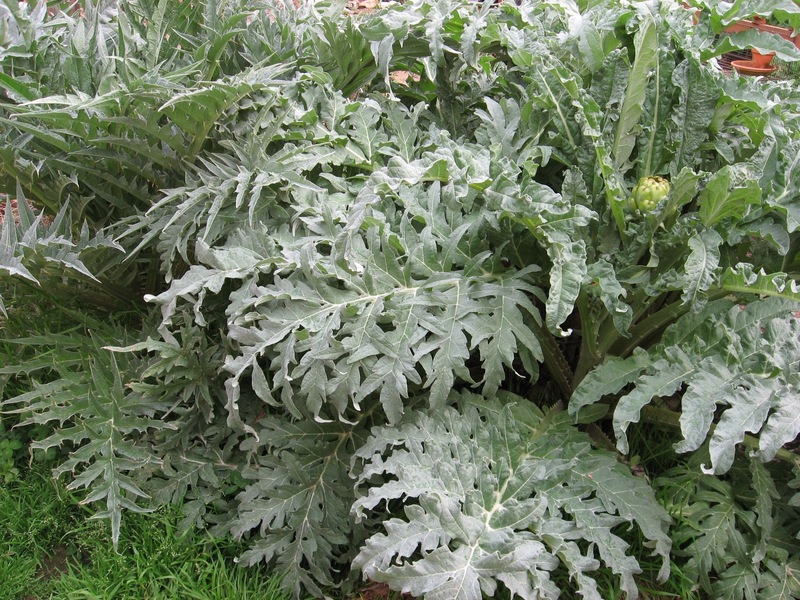 Artichokes propagate well from divisions taken from an established plant. If you plant them early in the year, you should get a fall crop. Seedlings planted in the spring will produce, as long as they have had the necessary amount of chill time. 2. Artichokes do well in fertile soil with good drainage, however they are known to be adaptable to different soil conditions. My plants have done well in soil amended with compost and chicken manure. 4. In hot weather artichokes need frequent watering — if you notice the leaves drooping, make sure you give the plant a deep soaking. 5. Overhead watering is not recommended. Unfortunately, I learned this the hard way. Overhead watering seems to attract aphids; the plants did much better with slow deep drip irrigation at their base. 6. In order to control aphids plant nasturtiums a few feet away from the artichoke plants; these flowers will lure the aphids away from the artichokes. The yellow nasturtiums are supposed to be especially effective, but I have had success with a mix of colors. Spraying with any chemical pesticides is not necessary and not recommended. 7. 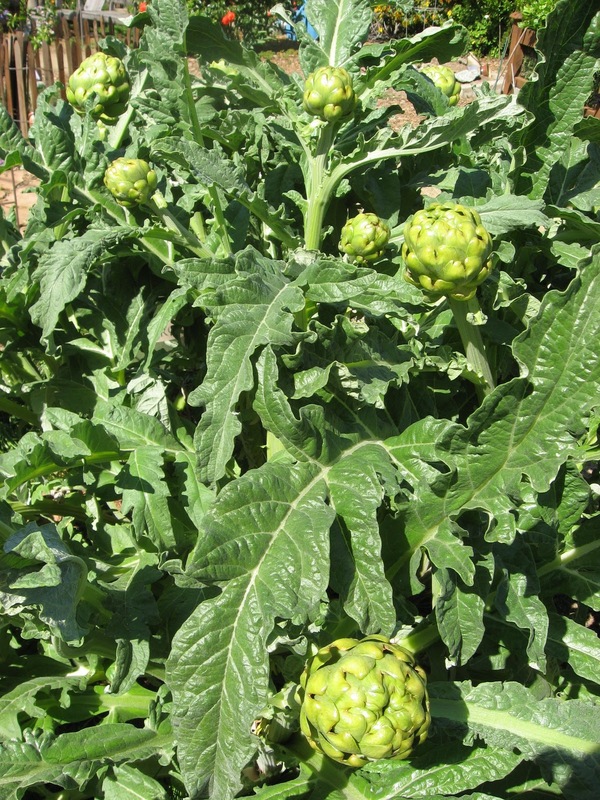 To harvest your artichokes, watch the buds develop and as soon as you see any sign of the leaves beginning to open, they should be harvested. If it is a globe variety, the edible bud should have very tightly packed leaves. 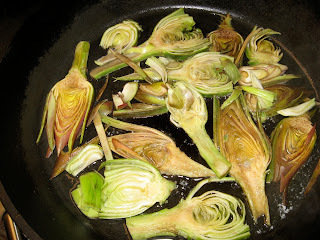 The elongated types of artichokes may have bud leaves that slightly open. You can also harvest the budding chokes when they are very small, for baby artichokes that are sometimes called for in certain recipes. 8. The plants need plenty of room — mine are about 4 feet high by 6 feet wide. The large leaves are fragile and can break easily — be careful not to drag the hose over them. 9. When the leaves wilt and get yellow, just trim them off to keep the plant from getting too raggedy. The late fall is a good time to trim all the stalks way back to twelve inches or so. 10. In the SF Bay Area artichokes do fine over the winter and enjoy the rain; by January my plants have already grown back beautifully lush. Artichokes will not tolerate temperatures below 25° F without protection. My farmer friend in Oregon grows them and he says they winter well insulated under the snow. So make sure that you mulch the plants to protect them through the cold seasons, and they may survive to grow again in the spring. Artichokes are beautiful showy plants with elegant silvery serrated leaves. You can display them in your front yard and occasionally let some of the buds open into spectacular flowers. As a child, I grew up eating them often, and they continue to be one of my very favorite foods.